In the nearly 30 years since the accident that made radio personality and columnist Dan Gottlieb a quadriplegic, he developed a finely-tuned quality of awareness that most people never achieve: he became an outsider among us--"like a foreign correspondent," as he puts it. From that vantage point, he has acutely observed the way people act, think, feel, and live--in short, he studied and learned exactly what it means to be human. Here, Dan shares his insights, written with humor, honesty, a gift for storytelling, and breathtaking compassion. 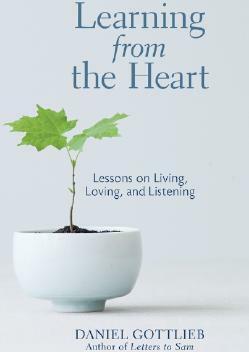 "Learning from the Heart" looks at what divides as well as unites us, including the problems of family life; difficulties confronting today's parents; challenges faced by the disabled and the aging; and issues of injustice that affect the way we understand the world and our lives. Although Dan is now speaking directly to the reader, rather than to his own family, you'll recognize the distinctive voice and format that caused an outpouring of e-mail from fans of "Letters to Sam" short anecdotal chapters rich in wisdom, generously revealing and deeply personal, and resonating with universal truths.